What causes the colors of the aurora? This picture from Alaska illustrates three bands of color in an aurora. The otherworldly colors of the Northern Lights and Southern Lights have fueled folklore for millennia, but their cause is actually quite straightforward. The aurora is caused by the interaction of high-energy particles (usually electrons) with neutral atoms in earth’s upper atmosphere. This process is similar to the discharge in a neon lamp, or the fluorescence of a television screen. The strongest auroras are quite bright, comparable to moonlight. The aurora occurs only above altitudes of 80 km, and infrequently above 500 km. 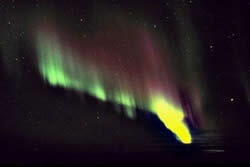 The average altitude for a normal intensity aurora is between 110 and 200 km. How are the colors of the aurora created? The sun radiates all visible colors, which is why sunlight appears white. The spectrum of visible light associated with the aurora is much more restricted. The aurora is caused by charged particles in the solar wind colliding with atmospheric atoms and ions. The collisions cause the electrons of the atmospheric atoms to become excited. As the electrons return to their original energy levels, these atoms emit visible light of distinct wavelengths, to create the colors of the display we see. The color of the aurora depends on the wavelength of the light emitted. This is determined by the specific atmospheric gas and its electrical state, and the energy of the particle that hits the atmospheric gas. The atmosphere consists mainly of nitrogen and oxygen, which emit the characteristic colors of their respective line spectra. Atomic oxygen is responsible for the two main colors of green (wavelength of 557.7 nm) and red (630.0 nm). Nitrogen causes blue and deep red hues. This is the spectrum of colors emitted by the various atoms in earth’s outer atmosphere. Most of the auroral features are greenish-yellow, but sometimes the tall rays will turn red at their tops and along their lower edges. On rare occasions, sunlight will hit the top part of the auroral rays to create a faint blue color. On very rare occasions (once every 10 years or so) the aurora can be a deep blood red color from top to bottom. Pink hues may also be seen in the lower area of the aurora. In addition to producing light, the energetic auroral collisions transmit heat. The heat is dissipated by infrared radiation, or transported away by strong winds in the upper atmosphere. Variation of colors in the aurora with altitude. How does altitude affect the colors of the aurora? The strong, green light originates at altitudes of 120 to 180 km. Red Northern Lights occur at even higher altitudes, while blue and violet occur mostly below 120 km. When the sun is "stormy," red colors occur at altitudes of 90 to 100 km. Entirely red Northern Lights may sometimes be seen, particularly at low latitudes. In earlier times, people often mistook this red light for fire on the horizon. As the above diagram shows, the different colors of the aurora at different altitudes relate to the varying composition of the earth’s atmosphere and its decreasing density moving away from the surface. The colors depend on the relative proportions of oxygen and nitrogen at the level of the auroral activity.